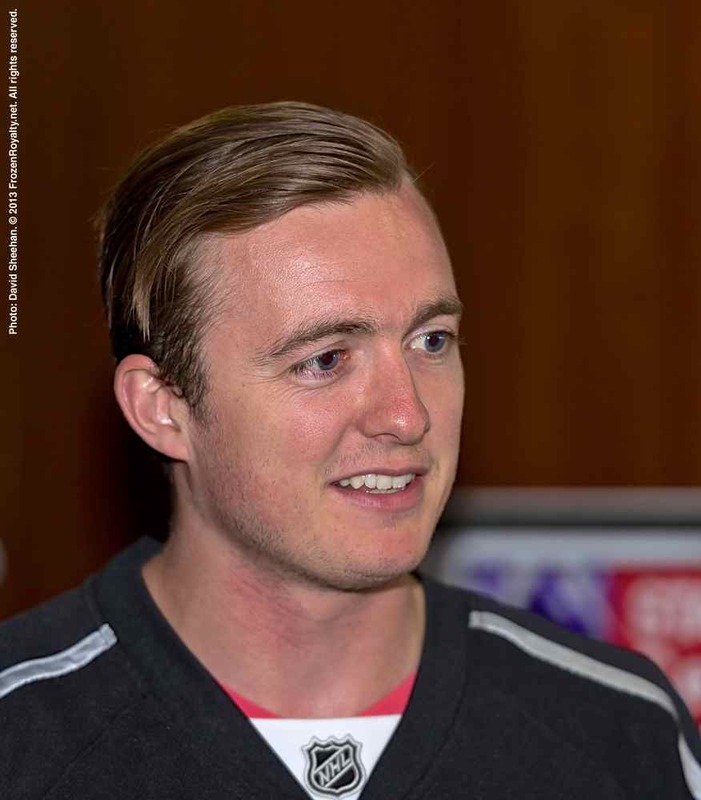 LOS ANGELES — Even though he knows quite well that he probably won’t be getting much playing time during the fast approaching 2013-14 National Hockey League season, goaltender Ben Scrivens has already settled in the Los Angeles area, and is trying to find his niche with the Los Angeles Kings. “I came in for the goalie camp in the second week of August, and I’ve been here since, so I’ve been here for about one month,” said the 26-year-old, 6-2, 192-pound native of Spruce-Grove, Alberta. Scrivens, who was acquired by the Kings from the Toronto Maple Leafs on June 24, along with left wing Matt Frattin and a 2014 or 2015 second round selection (Maple Leafs choice), in exchange for goaltender Jonathan Bernier, has been spending the last month getting settled in the South Bay, close to where most Kings players reside. Scrivens’ wife, Jenny, is from Camarillo, California, just northwest of Los Angeles in Ventura County. A big advantage for an NHL player moving to Los Angeles from Toronto is escaping the constant, heavy scrutiny by the rabid Toronto media, something that Scrivens is looking forward to. Having been in town for about one month, Scrivens has been participating in informal skates with the rest of his teammates as they get ready for training camp, which begins on September 11, with medical exams and tests (first on-ice session is on September 12). The obvious niche for Scrivens will be backing up number one netminder Jonathan Quick, and Scrivens indicated that the two are getting acquainted, so to speak. Another adjustment for Scrivens will be the differences between the Toronto dressing room, where players are still learning how to win, and the Kings dressing room. Already, Scrivens has been working with Kings goaltending coach Bill Ranford, honing his skills, and working to improve his game.